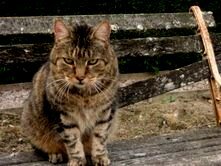 STREETKATZ RESCUE was born because of cats like Barty, a middle-aged tabby boy living on a park bench in a South coast seaside resort. His plight came to the attention of one of our supporters and, after unsuccessful efforts to trace an owner, he was scooped up, given urgent medical treatment and eventually found a new home. Many cats like Barty fall outside of the scope of other rescue organisations or cannot be helped in time. As a small organisation, STREETKATZ RESCUE can often move more quickly to help cats struggling to survive on the streets. All of our cats are looked after by volunteers, either in purpose built cattery pens in their gardens or indoors. We have no centre or sanctuary and no paid staff so all the money we raise goes to help the animals we rescue and rehabilitate. We operate in West Kent and East Sussex, mainly in the Tunbridge Wells area, and rehome within these areas - see our Homing page for further details. Streetkatz is a charity, recognised as such by and registered with HMRC, charity no XT23789. This means we can reclaim Gift Aid on donations and are tax exempt for some things but without the bureaucracy of being a registered charity with the Charity Commission. So our energy can go where it is most needed - to helping cats and kittens on the streets!